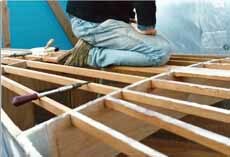 We've reached the stage in this self build boat project in which we move away from building in western red cedar strip and marine ply. Now the composite element of Alacazam's construction begins; time to reach for the chopped strand mat and polyester resin. Why? 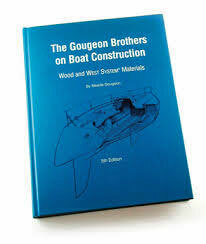 Well for the remaining components required to make the hull structure complete - primarily the cabin top, sliding hatch and garage, and cockpit - we've decided to construct them in GRP (Glass Reinforced Plastic), or fibreglass as it's often called. 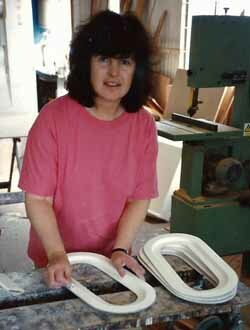 This is quite a complex process, as for each one we need to make a mould. And for those that require a female mould - like the cabin top for example - we'll need to make a plug, from which we make a mould, from which we mould the cabin top. See, I told you it was complex. 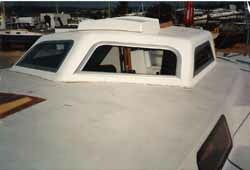 The cabin top is located over the galley and navigation area and will provide all-round vision from below. 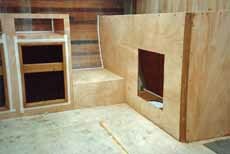 And as the forward edge and the sides of the cabin top will sit on the coachroof we used the coachroof as the base for the cabin top plug before it came out of the workshop. 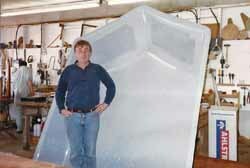 That way the GRP cabin top would fit perfectly. Wouldn't it? Chipboard was the main building material for the plug, as you can see in the above image. The rounded edges of the plug were formed with expanding polyurethane foam as used in the building industry, and sanded to shape. 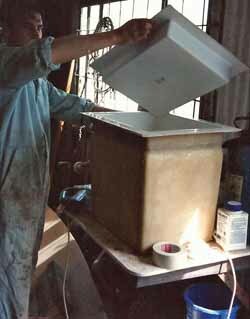 The entire plug was then filled and faired, and finally given a coat of black mould release agent. 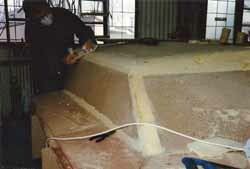 With the cabin top plug complete,the cabin top mould was then laid-up in chopped strand mat and polyester resin, to form the GRP mould as somewhat proudly exhibited here. 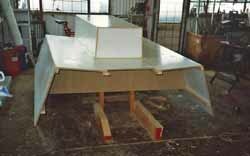 Foam core material was incorporated in the lay-up to provide sufficient stiffness for the mould to keep its shape. 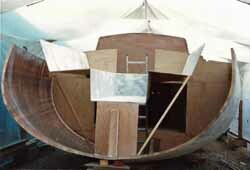 Finally, the cabin top was laid-up in the female mould and later emerged as the finished moulding. 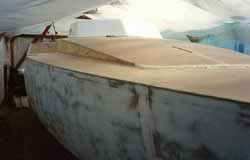 As expected it fitted Alacazam perfectly, where it was screwed and epoxied to the coach roof. With the smooth gelcoat on the outside of the finished moulding, the less attractive inside would later be covered with mural mousse headlining material. 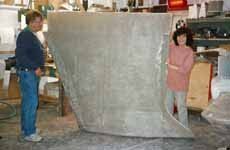 Mary lays-up Alacazam's sliding hatch cover. Where did she get those pants? 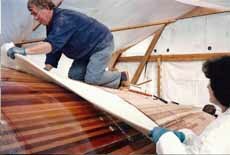 In the meantime, Mary was laying-up the fiberglass sliding hatch and garage, and the non-opening portlights for the hull sides aft. 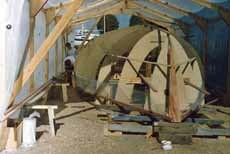 These would later be glazed with panes cut from clear polycarbonate sheet, and provide light in the heads, bosun's locker and aft cabin. 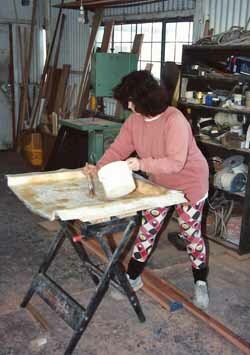 Cutting out the holes in the cabin top for the custom-designed windows was another one of those tasks filled with anxiety. 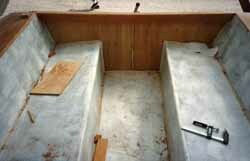 In a self build boat as in any other sailboat, whether intended for cruising or racing, good cockpit design is fundamental to the overall success of the boat; particularly the slope of the seatbacks, the width of the seats and the distance across the cockpit well. 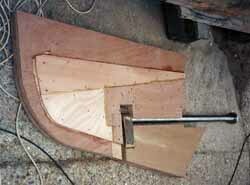 These were all taken account of in Alacazam's cockpit, the mould for which was fabricated in melamine-faced chipboard. Hey, we've got a cockpit! It all looked a little precarious until properly built in. You'll notice an absence of cockpit lockers. I'm not a fan of these, owing to an incident one night sailing single-handed around Cape Trafalgar in my Nicholson 32, Jalingo 2. 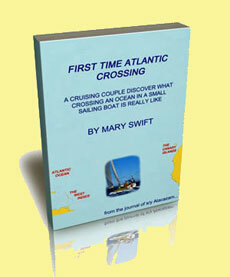 Briefly, I was head down in the cockpit locker looking for some warps to tow astern (it was blowing a bit) when we were pooped. About half a ton of water filled the cockpit, much of which ended up in the cockpit locker which did little help my state of anxiety. It won't happen with Alacazam. The last GRP moulding we had to do was the top opening fridge which was later installed in the galley with 4" (100mm) insulation all round.